Cave Man North: Not much..
Well I had a little time on my hands so I decided to experiment and here is the result. Can you say Chaos. Well I decided too try to use all of the tools available and they came out with mixed results as you can see. 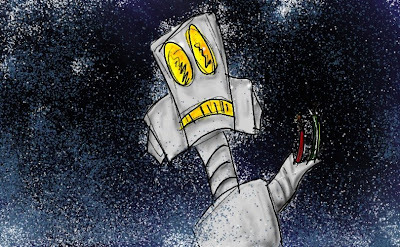 In case you can't tell, it is robot in a snowy place waving with its arm blown of. Really simple but its pretty fun to just experiment right now. An comments are welcome. Hey Dave! I think it is Cool- does your tablet let you draw right on it then and special effects or something? I have never even seen that kind of tool! I love and miss you- I was way excited to see your blog today- I haven't updated ours for such a long time! hope to talk to you soon! And I just realized I didn't give you any requests! I just thought of one that would be interesting, to do a robot lasso-ing a smaller robot or something like a cowboy. oooo and if you want more complication, have him on a horse. That woudl be a cool picture! you could also do some western background with your special effects or mountains would be cool too... I am sure you have plenty of your own ideas, but since you asked!! And I love to see yor art, its way cool what you are able to do! I love you tons and Parker says hey too! I was just blogging about thanksgiving and it made me think about the fun time we had Golfing together. it was crazy! You're the best, talk to you later. One more P.S. My word verification to post this comment is balla. Fitting!